Sometimes an idea can be so far ahead of its time that it never really takes off or, as in the case of the NFC tag, you just have to crawl for about 30 years before you catapult into a highly competitive race. NFC (Near Field Communication) is, in many ways, the next-generation RFID (Radio Frequency Identification). One of the first commercial uses of RFID was in the retail space utilizing unpowered electronic tags and a powered reader to track merchandise. Fast-forward about 20 years to the development of NFC, a technology that first found its footing in mobile payment, ticketing and toll applications, and is now making waves in the creative marketing sphere. Each year more smartphone devices are being outfitted with NFC, which allows you to change settings, transfer data, launch apps and perform various actions just by holding your device in close proximity to either a NFC tag or another NFC enabled device. It is surprisingly simple and, unlike QR codes, there is no app to download and no need to line up your camera to read a code or image. Currently Blackberry, Android and Windows phones support NFC. Apple has restricted the NFC usage on Apple Devices to work exclusively with Apple Pay; however, many have speculated (and in some cases Apple spokespersons have alluded to) that this will change sometime in the not-too-distant future. While NFC isn’t mainstream in marketing yet, you’re likely to see it pop up in innovative ad campaigns and at tradeshows and events across the world. In the travel and tourism industry we see the use of NFC tags as a way to launch users into immersive, rich media content and experiences with just a wave of their phone. 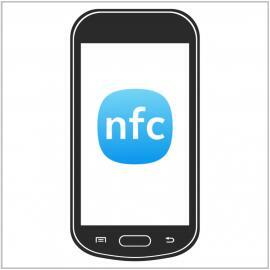 Click here for a full list of NFC enabled smartphones. VP of Marketing Andrea Wood is the creative force behind our corporate presence at industry events, a responsibility she comes by naturally: she enjoys planning parties so much she has a whole room in her house dedicated to crafts! Constantly striving to learn and do more, Andrea is also a key contributor on Miles’ research and development front, sharing insights and strategy around emerging technology, trends and services.